The 510(k) clearance process is often met with a mix of trepidation and anticipation by medical device companies. It’s one of the final hurdles to get over before your medical device can be brought to market, so naturally, companies are keen to get through the process as quickly as possible. This can lead to a few common mistakes, which we’re going to dig into in a minute. First of all, there’s something we’d like to make clear; when you’re talking about a 510(k): The term “clearance” is the correct one to be using rather than “approval.” It might sound like semantics to you, but in FDA terminology, this is very much a parlance that matters. The term “approval” is attached to different meaning, so stick with clearance when it comes to your 510(k). Free Bonus Giveaway: 5 Tips for Using a Predicate Device. Click here to download. The intended use statement is often screwed up by inconsistent application into other sections of the 510(k). There are a number of sections throughout where you’ll find you need to restate that intended use statement and you’d better have it right if you want the FDA to accept your submission. A common mistake is messing with statements that are more about indicated use rather than intended use, so it’s very important to know the difference between the two. (We wrote about those differences here). So, let’s say you have submitted a 510(k) that has some inconsistencies. There’s a process called “refuse to accept” where the FDA has 14 days to do a quick review of your submission, just to ensure you’ve submitted everything they would expect and that contents are what they expect. They also do a quick review of intended use, so if this doesn’t pass muster, it will be kicked back to you. This can be very frustrating because you’re always hoping to get past this phase easily. It’s also something that you can get through easily because there are guidelines out there to follow - you are in control as the person submitting the 510(k). Use the guidance document the FDA provides for your 510(k) submission! You can get hold of their “Refuse to Accept” (RTA) checklist here, beginning at page 17 of the document. They always tell you what they’re going to do and what they’re looking for, so it shouldn’t be a surprise. In our experience, follow the checklist exactly, then give your reviewer a heads-up by referring to the relevant pages of your documentation next to the checklist items and provide this with your 510(k) submission. This let’s them know exactly where that information can be found and is a good indication that you’ve submitted everything needed. Back in the day, FDA used to accept “I promise” statements where you as the submitter could promise to complete things such as sterilization validation or biocompatibility later. FDA no longer accepts those “I promise” statements, yet many people mistakenly believe they can still use them. Not providing the testing that FDA expects will delay your clearance. You might be able to “fake it” to get through the initial “refuse to accept” phase, but a review of sections by FDA will discover these are incomplete. Remember, different types of testing can take 10 weeks or more (such as biocompatibility, electrical safety, and sterilization validation) so your clearance can end up being put on hold. FDA wants to see the results of all of those necessary tests. Another thing to note here is that there has definitely been a trend of “more is more” when it comes to testing expectations from the FDA. Whereas previously, you may have been able to leverage existing biocompatibility data in some cases, now they want to see testing specific to your own product. You should also be careful to include protocols, results and reports. While you used to be able to get away with just providing a summary, these days FDA wants to see more to verify the rigorousness of your testing. FDA wants you to provide evidence to back up your stated shelf life. Many companies use an accelerated aging process, following an accepted methodology to determine that shelf life. FDA does usually accept these as evidence, but in our experience, providing some real-time shelf life studies to corroborate the accelerated aging will help you out considerably. Test out many data points, such as 1-, 2- and 3-year accelerated data, along with some real-time testing. If you plan these out well, there’s a good chance you will have 1-year shelf life samples for doing real-life aging tests. FDA wants to see a correlation between real-time and accelerated aging data. Help to close the gap for them by planning for it. They can otherwise pull you up on it and require an additional submission, further delaying your clearance. The expectation of risk management is increasing across the board. Regulatory bodies want to see good documentation and risk management practices. Be prepared to show your list of requirements and the paper trail for your traceability. Greenlight Guru can definitely support these things by centralizing your data and making it easy to access and update. Your 510(k) submission is effectively a story from which you want the FDA to conclude that you have a safe product that is substantially equivalent to a predicate device. Your design controls play a big role here as your documented, objective evidence proving the safety and efficacy of your product. The contents of your design history file (DHF) can also be used as a guide from which to prepare the 510(k) submission. We wrote more about the links between your design controls and 510(k) here. Descriptions comparing your device to another can be tricky. The difficult balance is that you need your device to be shown to be novel and unique, but not so different that the FDA thinks that your predicate used is not a good example. We all think we have a “better mousetrap”, so you may need to paint a picture using multiple predicates. However, this is also challenging because you need to demonstrate why all the differences don’t matter. It’s definitely a bit of an art and we’d encourage you to consult with someone who has experience navigating this area. If you were to get this wrong or to inadequately demonstrate that equivalence, it can create a significant delay for your 510(k) clearance. For example, leaving out page numbers or the e-copy. You also need to name the file according to conventions and the size of the file matters, too. We recommend hiring an industry consultant who is familiar with this process and can identify any formatting errors before submission, in addition to simplify the process for you. Companies tend to screw up the little things all of the time, causing delays in the clearance. 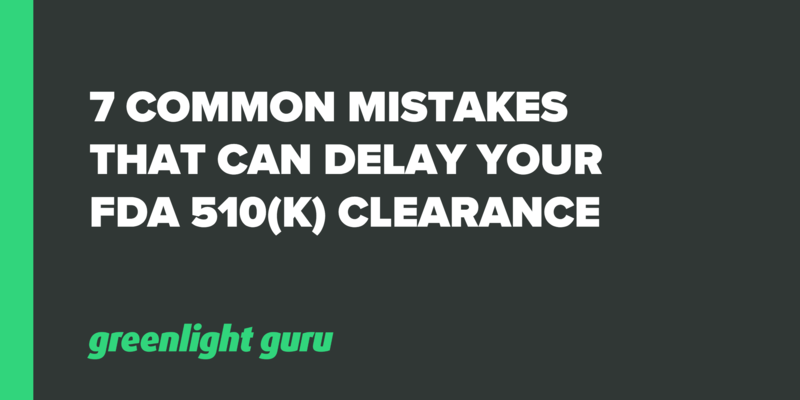 Your 510(k) clearance is something that we suggest you give consideration to from the start of your product design process. For example, keeping an up-to-date design history file can help you to simply lift parts directly onto your 510(k) submission, rather than trying to start afresh. Avoid the common mistakes we’ve outlined here and allow some time to put together a well-written submission. If you’re in any doubt, then we’d recommend seeking the help of a consultant to help guide you through the submission process. Still using a manual or paper-based approach to manage your design controls or quality processes? Click here to learn more about how Greenlight Guru's modern eQMS software platform exclusively for medical device companies is helping device makers all over the globe in more than 50 countries get safer products to market faster with less risk while ensuring regulatory compliance.